The title and name took some time to brainstorm. In its current iteration, the Accessibility Rights Club: Artistic Development Events, or ARC:ADE, is almost directly inspired by the Seattle Indies, specifically, my first trip back to the “inclusive and welcoming community for everyone” for upcoming videogame developers. As I sat writing what would become an upcoming short story about Jane talking with someone about his idea for a videogame, I thought about ARC. My college wasn’t big enough to have any large clubs or group activities, just the occasional activity posted on random bulletin boards, and I think that’s a shame. I learned the most about socializing in college. Yet, I could have learned so much more! I’m still far too shy unless I’m psychologically prepared and have turned on that socializing switch. Rather than blame external factors, there are more things I can do now, and if I write about what external factors could be useful for people going forward, then we can create a better reality. That’s where the idea for the University of Eville’s Accessibility Rights Club started. There, will, of course, be different clubs that John and/or Trishna will join. That’s just the main one they’ll stick with perhaps secondarily because of its professional developments. Primarily, they’ll be there for ARC:ADE. The ARC will be like any department on any college campus. It will have an area with a lobby and reception desk, a few offices, and a gathering hall. The ARC:ADE will host weekly activities on the weekends for about two hours over myriad artistic endeavors from watercolor painting to creative writing to introductory programming. Completely open to any actively-enrolled student, any graduated college student, and guests of students, the goal of each two-hour session is to invite everyone to try something new and meet new people. John and Trishna will likely go frequently. That’s how they join ARC. Maybe they’ll learn programming there? Maybe I’ll learn programming there? 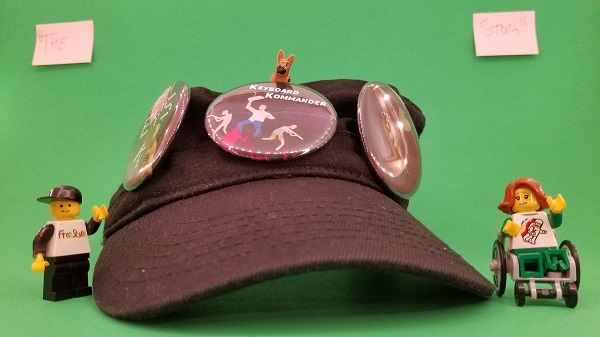 Inspirations: While I was making this hat for the Seattle Indies Expo 2018, I thought, as I always do, about how the activity I’m currently doing interacts or informs “The Story.” I also wanted a nice two-day theme tie-in. Photo: I have since made “The Story” in the background slightly easier to read.